The Artist: The arrival of sound threatens Hollywood's biggest movie star. Mark Kermode slips on his tap shoes in honour of The Artist. At a time when eye-straining, ear-bashing, hi-tech 3D movies are being widely touted as the inevitable ‘future of cinema’, Michel Hazanavicius’ The Artist reminds us that great movies – and great movie-making techniques – are timeless. An affectionate homage to the early days of cinema before the advent of the ‘talkies’, this wonderful near-silent black-and-white beauty about a matinee idol threatened by the arrival of sound tips its cine-literate hat toward everything from the swashbuckling romps of Douglas Fairbanks to the pathos of Chaplin, the slapstick of Keaton, and the narrative template of Singin’ In The Rain (1952) – with a dash of A Star Is Born (1976) thrown in for good measure. That such a movie should have become an immediate critics’ favourite at the Cannes Film Festival is hardly surprising; like Martin Scorsese’s Hugo, the movie speaks to an audience with a particular affection for the history and mechanics of early cinema. What is more remarkable is the mainstream multiplex approval which The Artist has enjoyed, proving that its old-fashioned charms are as universal today as anything modern cinema has to offer. Garnering 12 BAFTA nominations (including – significantly – nods for both music and sound), The Artist leads the pack at this year’s Film Awards, with recognition of the film’s technical prowess ranging from its gorgeous monochrome cinematography to pitch perfect art direction. 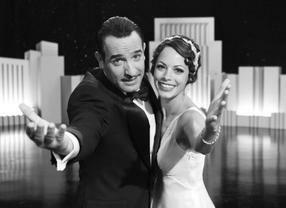 The Artist’s mainstream multiplex approval proves that its old-fashioned charms are as universal today as anything modern cinema has to offer. At the heart of its magical spell is a trio of terrific performances: from Jean Dujardin as the fading star, Bérénice Bejo as the rising ingénue, and (of course) Uggie the wonderdog. Enthusiastic online campaigns to earn awards nominations for Uggie demonstrated the degree to which The Artist has captured the popular imagination; the morning after the film triumphed at the Golden Globes, it was Uggie whose picture was all over the papers. Receiving yet another prestigious award in London recently, Dujardin admitted that when Hazanavicius (with whom he had previously worked on the OSS 117 spy spoof movies) first told him he wanted to make a black-and-white silent film, the actor thought the filmmaker had “gone mad.” Thankfully, there was method in that madness, with the success of The Artist proving that there is still a place in the 21st century for art forms which were first forged over a hundred years ago. Watch Mark Kermode share his thoughts on the Orange British Academy Film Awards nominations at the official announcement on 17 January 2012.